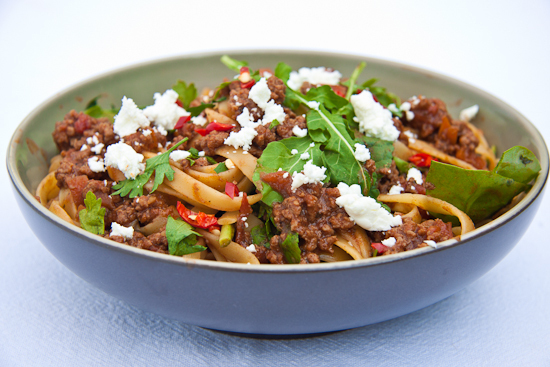 Summery Spaghetti bolognese packed with veg and fresh baby spinach, rocket and Italian Parsley. 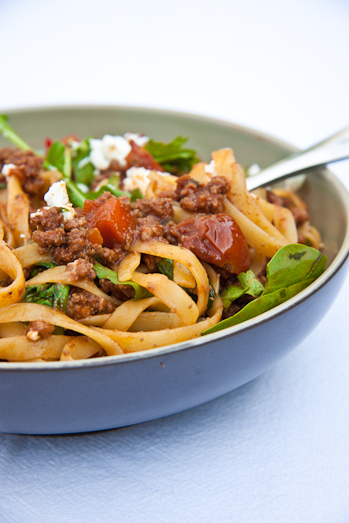 When I first saw this summery spaghetti bolognese done on Bits of Carey over at Food24, I knew it was genius. Not only is Spaghetti Bolognese the staple of mothers everywhere, but it’s also got a comfort level not easily met by anything else. After all, pasta in every shape and form equals comfort, no? I have always veggie-loaded my Spag Bol to boost my family’s 5-a-day intake. I always, always, ALWAYS add fresh carrots, onions and garlic. Sometimes peas and corn, sometimes green beans or broccoli. But when I saw Carey using fresh baby spinach and rocket, I almost weeped. 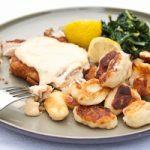 There’s just no better way to take this, usually winter-y dish and make it completely perfect for summer than adding some fresh and flavourful leafy veg to it. I didn’t stick to Carey’s recipe, not because there’s anything wrong with it, far from it, but because I very rarely stick to recipes. I knew my serving would have chopped chillies (as always) and even though my heart melts at the thought of spag bol with a good grating of mature cheddar ontop, I thought the Goat’s Cheese would add a nice sharpness and creaminess. But you best decide for yourself which is best..so you’ll have to make this a few times…ooohhh…just think of it with Feta. mmmmmm…. I also added some fresh flatleaf Parsley with the rocket and spinach, just because I love the flavour so much, but feel free to use any leafy vegetables, just make sure that you only mix it in when you toss the pasta and sauce together. That way it just wilts enough but keeps that fresh and vibrant flavour and colour. In a large pot, fry the onions and carrots in 2tbsn oil until the onion is soft and translucent. Add the garlic cloves and fry for another minute. Add the mince and break up with a fork/spoon. Allow to brown for 2-3 minutes. Add tomatoes, tomato paste, sugar and spices. Stir to combine everything. Add the bovril and water, mix through and turn the heat down. Cover and allow to simmer for 25-30 minutes. Season to taste. Toss the cooked pasta with the sauce and the leafy veg. Serve with a sprinkling of cheese and chopped chilli if desired. I made this yesterday everning and my husband could not believe it :). This is the best bol sauce ever. Thanks so much for this. This might sound weird, but I spent the first couple of years of my teenage lifein Rome, then travelled all over the globe. Now I’m living in New Zealand, with my Chinese wife, and son we had whilst in Japan! Truly international, eh? Anyway, I’ve been trying to rediscover the smells and tastes of my youth with some authentic Italian recipe like these, best I’ve found so far! Thanks again, I’ll see if I can add the feed to my google reader tonight, though my son usually does that for me!